Children of clergy - Fiction. "Fischer's writing resonates with the novelist's truest gifts inevitability and surprise"
The new pastor's family made an almost perfect picture standing on the church platform that splendid first Sunday morning in early 1958. The "almost" of that picture was the youngest son, Ben. At first glance he might have looked like a normal nine-year-old boy dressed up against his will for church. But there was something else about Ben that made him stand out from the rest of his family and the church something that kept him from pretending that he wanted to be there. Within and without the hallowed walls of the Colorado Avenue Standard Christian Church, the sheer honesty of Ben Beamering will cause all kinds of commotion and consternation as he actually does and says what so many believers always wanted to do and say but didn't dare. And neither his family nor the church are prepared for the challenge. 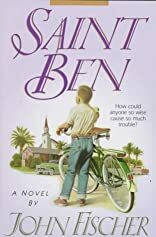 No one who met Ben was ever quite the same, and no one loved Ben more and knew him better than his best friend Jonathan, who tells this captivating story. "What at first appears to be a slender story of boyhood bonding - soon explodes like a skyrocket -. The multi-talented Fischer's debut as a novelist is auspicious indeed"
About John Fischer (Author) : John Fischer is a published author of children's books. A published credit of John Fischer is Saint Ben.